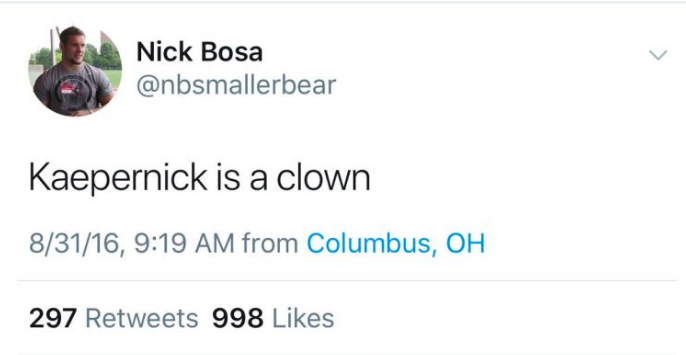 Deleted or not, could Nick Bosa's controversial tweets come back to haunt him? If Nick Bosa wasn’t already aware of The Streisand Effect, he is now. The phenomenon, which posits that an “attempt to hide, remove, or censor a piece of information has the unintended consequence of publicizing the information more widely,” is certainly in play now that former Ohio State defensive end Bosa has admitted to deleting tweets in preparation for the upcoming NFL Draft. While it certainly stands to reason that they would have come up no matter what, by deleting them (and talking about why he deleted them), he’s brought attention back around their way tenfold. The question now is, will it cost him? The tweets in question include his negative feelings towards Colin Kaepernick and NFL players who support him, his disdain for the movie Black Panther, and his equal disdain for Beyonce and her music. We’re not going to spell out the common thread in all of those sentiments but we’re sure you can figure it out for yourself. The thing is, of course, Bosa is a dynamite football player and was long-considered one of the top picks in this year’s draft. Before Kyler Murray committed to playing football, Bosa was considered the consensus pick for No. 1 overall. However, that’s changed in recent months and now many people are predicting the OSU player to go No. 2 to the San Francisco 49ers. Last year he seemed to delight in posting political takes, including his support for President Trump, on Twitter and needling dissenters. (He also caused a minor social media stir by criticizing Beyonce, Black Panther and Colin Kaepernick, all eventually deleted.) As the combine drew near, though, his online behavior grew increasingly bland. I asked why he seemed to abandon something he had previously embraced. It’s a little unclear if Bosa feels that way because the 49ers’ ownership is supportive of Kaepernick (but not enough to re-sign him) and the player protests or if because San Francisco and the Bay Area are historically very progressive and his tweets wouldn’t go over very well with many locals. Regardless, there’s a discussion be had about why Bosa felt like he had to delete the offending tweets to appease one specific team but not others. But the more pertinent question is, could Bosa’s tweets (and the opinions behind them) actually affect his draft stock? We’ve seen stranger things cause a guy to drop, even to the point where hearsay has affected draft stock. Would a team like the 49ers be willing to take a social stand and pass on a player as talented as Bosa, knowing that one of their rivals would likely swoop in and snag him with no problem? It seems unlikely. NFL franchises are many things, but moral beacons aren’t one of them. Besides, as Niners Nation points out, there are already plenty of people in the NFL (and on the 49ers roster) who would agree with Bosa’s sentiments. Everyone puts their opinions aside on Sundays, which is what ultimately keeps the wheels in motion. Ultimately, the issue isn’t what Bosa tweeted, it’s what he believes and whether or not he’s going to continue sharing his opinions once he’s drafted. Just like Kaepernick, whom Bosa clearly dislikes, he has to know that speaking out in any form will be met with pushback, regardless of which side of the political aisle you’re coming from. Though, to be fair, we don’t think the #StickToSports crowd will be quite as upset about Bosa’s comments as they were about Kaep’s. Call it a hunch.